“Alam ko shocking ito sa mga lalaki at mahirap ito ipractice dahil this is not the culture that we practice especially the men. This is just information that we can try minsan kasi we have to try different things to satisfy our hunger,” the actor concluded. Most of the commenters on Padilla’s IG post agree on what the action star said. 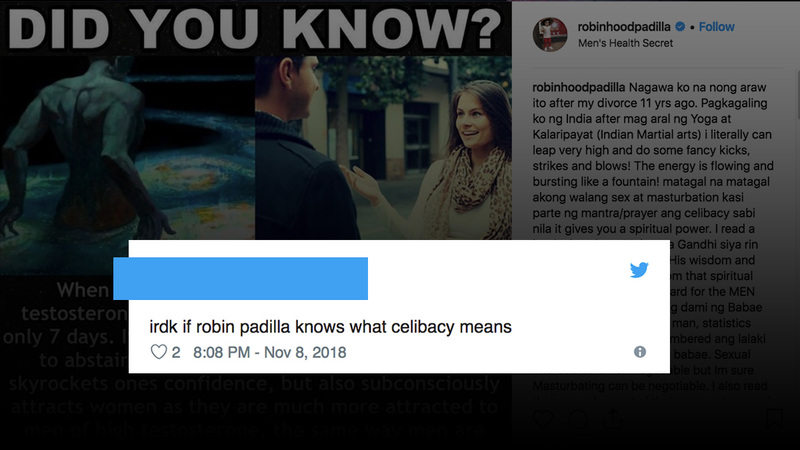 Some even shared their experiences and benefits of being celibate like the actor. “Starve your body, feed your soul,” one netizen said. Netizens on Twitter also expressed their thoughts on Binoe’s tip. How is that even connected? What could these possibly mean? Are you ready for #NoNutNovember like Robin?